One sunny day this summer our neighbor Fred, the head of the Cemetery Committee in Island Falls, drove in to our driveway with something in a small trailer pulled behind his ATV. He walked to our door, knocked and asked if I knew anything about the contents. I did not. But I could speculate. The dates and the names of the parents determined that these were infants that had been born to my great grandfather’s older brother. 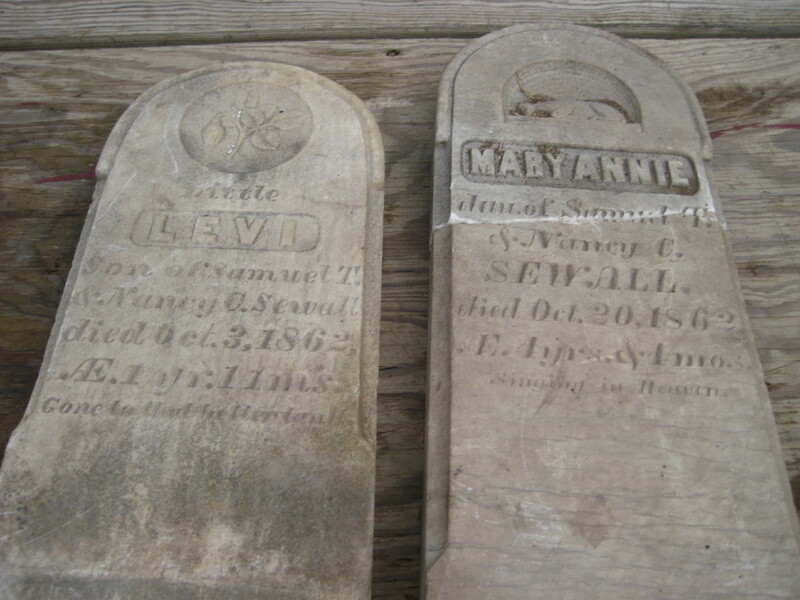 They died 12 days apart, brother and sister, in October, likely the victims of a flu or, worse yet, diphtheria, that they had somehow shared with each other. The stones had been found in the barn of an older neighbor whose estate was being auctioned off; mysterious the things we store in our closets, so to speak, the secrets we all carry that only are in the halls of our own mind. No, I did not know their story. But seeing these little tombstones my heart and mind recollected a time where life was more uncertain, where we were held more in the grips of the whims of nature, whether it be weather or disease. We have never truly escaped this grip, even with modern medicine and weathermen. Perhaps we experience it more now in a different way by the way we treat our environment and each other, I wonder. Little ones, rest in peace. (age 1- little LEVI GONE ON TO A BETTER LAND, obviously named for his grandfather, my great great grandfather and age 4-DANCING IN HEAVEN MARY ANNIE).